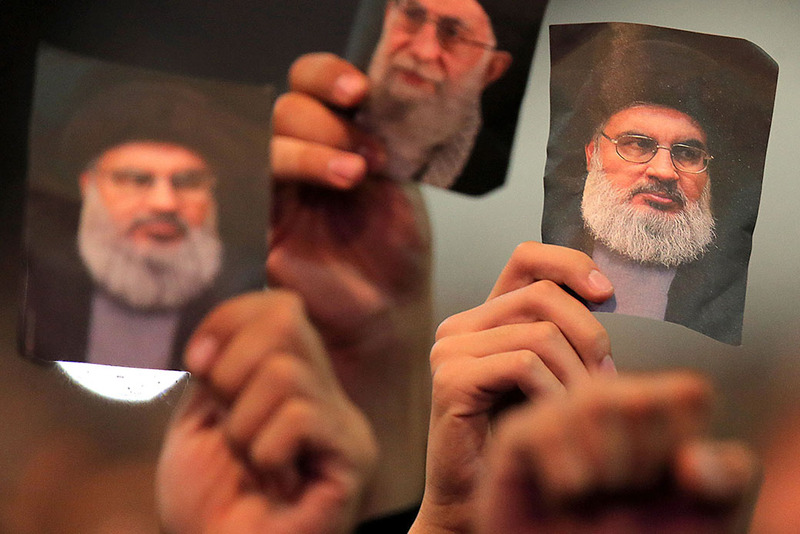 Supporters of Lebanon's Shiite militia Hezbollah carry portraits of Iran's supreme leader, Ayatollah Seyed Ali Khamenei, and Hezbollah's secretary-general, Hassan Nasrallah, during a ceremony on the eve of the 10th day of the mourning period of Muharram, which marks the day of Ashura, in a southern suburb of the capital Beirut, October 11, 2016. The United States must strengthen its public diplomacy strategy to better compete with Iran in the struggle for power and influence in the Middle East. No longer do Arab governments have the monopoly on information flows in their countries. The use of mass media technology, combined with a multiplicity of actors—including Europe, Turkey, Russia, and Iran—have made competition in the Middle East information marketplace ever more challenging. Moreover, news consumption in the Middle East has changed, as audiences in the region turn from their television screens to computers and phone apps such as Facebook, WhatsApp, and YouTube to browse headlines.2 These social media platforms have made it easier for U.S. adversaries such as Russia and Iran to disseminate disinformation as news—including anti-American narratives—on an unprecedented scale and at the same time make it more difficult for the United States to respond.3 Yet how this battle to shape public opinion in the Middle East affects U.S. influence and interests in the region is often overlooked. Recently, for example, Facebook, Twitter, and YouTube removed hundreds of fake accounts and pages originating in Iran that used anti-Saudi, anti-Israeli, and anti-Trump narratives as part of an influence campaign targeted at users around the world, including in the Middle East.4 These disinformation campaigns exploit and exacerbate increasingly negative views of American leadership, U.S. soft power, and even American people among publics in the Middle East. In doing so, they undermine U.S. security and economic interests, as well as enhance these actors’ influence in the region.5 The Iranian government is a key purveyor of anti-American rhetoric in the Middle East as it seeks to compete with U.S. influence in the region not only through hard power but also in the arena of public diplomacy. Iran has emerged as a top priority on the Trump administration’s foreign policy agenda, but much of the administration’s discourse focuses on Iran’s nuclear program and its destabilizing policies in key parts of the Middle East, including Syria, Iraq, and Yemen.6 The United States counts on economic sanctions, military power, and other hard-power levers to counter Iran. However, the U.S. government lacks a significant, overt effort to tackle a more insidious and largely overlooked dimension of Iran’s influence operations in the region: its public diplomacy outreach aimed at shaping the information landscape and public opinion of key audiences in the Arab world. Currently, there is no coherent, consistent strategy in place to respond to disinformation deployed by Iran and other actors that mischaracterize the United States, its policies, and its interests in the region. At the same time, there is an absence of significant, long-term U.S. soft-power outreach—an important component of shaping and amplifying American narratives to Arab audiences in the Middle East. This report analyzes the government-led public diplomacy efforts of Iran, key Arab states, and the United States in the Middle East, exploring how each actor engages with publics in the region. With a focus on the past 15 years following the 2003 Iraq War, this report examines the various narratives used by each actor and the different public diplomacy tactics used to support them. Finally, the report presents recommendations for the United States to enhance its public diplomacy efforts in the region to better counter and effectively compete with Iran in this space. While soft power is more broadly defined as “the ability to affect others to obtain the outcomes one wants through attraction rather than coercion or payment,”7 public diplomacy can be understood as the strategy of leveraging soft-power resources to specifically communicate with, attract, and influence foreign publics.8 Given the divergent interpretations and execution of public diplomacy by each of the three actors considered here—the United States, Iran, and Arab Gulf states—and the opacity of Iranian and Arab strategy in the region, this study considers any government-led activity—including a sample of media and communications, cultural outreach and programming, and people-to-people exchanges—targeted at attracting or influencing Arab publics to be under the public diplomacy umbrella. For the record, public diplomacy does not include actions such as humanitarian aid, philanthropic work, or funding Islamic charities, as they rely on payment to exert influence. The activities considered in this report rely on inherent appeal—determined by audience receptivity—and provide an entry point for countries to cultivate rapport and build trust with foreign publics, shape public perceptions of their behavior and that of their adversaries, and enhance their influence. Iran uses public diplomacy in the Middle East as a key component of its efforts to shape regional dynamics. Relying on a menu of narratives that appeal to popular Arab sensibilities—including anti-imperialism, religion, and the Palestinian cause—transmitted through media broadcasts as well as cultural and religious outreach, Iran regards public diplomacy as pivotal in increasing its influence in the region. Any success the country enjoys in this arena can be attributed not only to inherent advantages such as geographic, religious, and historical proximity but also to its capitalization of the policy blunders of other actors in the region; a long history of using public diplomacy to pursue its interests; and a soft-power vacuum created by the effective absence of Arab governments and the United States in which Iran operates largely uncontested. Leading Arab governments have not engaged in sustained public diplomacy efforts in key arenas of competition with Iran. Arab governments, especially Saudi Arabia and the United Arab Emirates (UAE), have mostly targeted their public diplomacy resources and efforts at U.S. publics. To exert influence in other Arab countries, these states limit their outreach to governments and elites through traditional channels, or they resort to checkbook diplomacy and coercive measures. Pan-Arab media broadcasts and publications are used to project Saudi and Emirati government agendas, comprising the bulk of their public diplomacy in the region. The two countries also use religious diplomacy and their respective “brand” of Islam to counter what they view as Islamist extremism, including political Islam, and appeal to publics around the region, with mixed results. Saudi Arabia and the UAE benefit from natural affinities with Arab populations, including shared Arab and Sunni Muslim identities, but their image also suffers from their destabilizing roles in conflicts across the Middle East, such as in Yemen; divisive, often sectarian messaging; and a failure to present concrete, forward-looking counternarratives that address public attitudes and concerns. U.S. public diplomacy in the region is hindered by perceptions about U.S. policy and recent administration efforts that have cut resources for the State Department and other agencies engaged in soft power. U.S. public diplomacy outreach in the Middle East has been a persistent challenge for practitioners due to unpopular American policies in the region and an overall decline in global American influence, compounded by the presidency of Donald Trump.9 And while the Trump administration has made countering Iran a regional priority, there is no apparent effort to develop a complementary public diplomacy strategy or an American counternarrative that directly competes with Iran in the influence space of key Arab countries. This influence vacuum is further exacerbated by the lack of a clear U.S. Middle East strategy and the downgrading of a values-based approach to diplomacy. U.S. adversaries such as Iran are making use of public diplomacy not only to increase their own influence in the Middle East but also to galvanize Arab publics against the United States in a relatively cost-effective way. Meanwhile, the United States has mainly focused on hard power and economic sanctions to counter Iran in the region, ceding the battleground of public diplomacy. Of course, public diplomacy cannot erase unpopular policies, which the United States, Iran, and Arab Gulf states all grapple with, but it would be short-sighted to turn a blind eye to how Arab public perception of American power directly affects the United States’ ability to achieve policy goals in the Middle East. Arab government failures, combined with a history of unpopular American policy decisions in the region, have created a fertile ground for Iranian narratives to gain traction.61 Moreover, the Arab revolutions of 2011 created an opening for Iran to align with different actors on the ground—from the Houthis in Yemen to the Shiite-majority protesters in Bahrain—and expand its influence.62 While experts disagree on how potent the Palestinian issue remains in Arab psyches today, this narrative potentially provides Iran with a long-term solution to weather the reputational damage it suffered for supporting Syrian President Bashar al-Assad’s brutal military campaign. As long as Khamenei remains the supreme leader, Iran is unlikely to abandon the pillars of anti-Americanism and anti-Israel rhetoric that characterize its anti-imperialist narrative—and indeed constitute the very essence of the Islamic Republic.69 But even if Iran is not there to carry the narrative, other actors—including Russia, extremist groups, and some Arab intellectuals—will prove all too willing to take the lead. Arab Gulf states—particularly Saudi Arabia and the United Arab Emirates—have largely focused their messaging and public diplomacy outreach to publics in the United States. For decades, these countries have used public diplomacy to try to enhance their image and promote their policy interests in Washington: A recent example is Saudi Crown Prince Mohammed bin Salman’s charm offensive tour of the United States to build relationships and promote his country’s reforms.70 In the Middle East, however, the countries largely neglect soft power, relying instead on a combination of funding and coercion to project their influence. In the soft-power arena, the Arab Gulf countries use satellite media channels to disseminate their views of current events. These stations give their owners a tight grip on the information space and the power to export the narratives they wish. Beyond messaging through media platforms, however, there is no coherent Gulf Arab state public diplomacy apparatus that aims to compete with Iranian soft-power influence in the region. Saudi Arabia and the UAE also use religious public diplomacy, in tandem with countering violent extremism (CVE) programming, to promote their embrace of a more moderate, tolerant interpretation of Islam. These efforts include multilateral initiatives such as Hedayah, a center hosted by the Emirati government and focused on CVE research and best practices, and the Sawab Center, a joint UAE and U.S. program created to combat extremist narratives and propaganda.84 During U.S. President Trump’s May 2017 visit to Saudi Arabia, he and King Salman bin Abdulaziz Al Saud inaugurated the Global Center for Combating Extremist Ideology (GCCEI), also known as Etidal (“moderation”), which boasts “unprecedented technical superiority in the tools and technologies used to combat online extremism” as a comparative advantage.85 This aspect of Arab Gulf public diplomacy aims to position these countries as global leaders of moderate Islam and the fight against extremism—a narrative that is projected globally but is especially designed to resonate with the West. At the same time, this messaging assumes an Arab audience that views Iran as a primary existential threat, despite some existing polling evidence to the contrary.93 Earlier this summer, a survey based on face-to-face interviews with 18,830 Arabs across 11 countries in the region—including Lebanon and Iraq—showed that when asked to “name the country that poses the largest threat to their national security,” 82 percent of respondents pointed to Israel; 70 percent pointed to the United States; and 47 percent pointed to Iran.94 This finding has been consistent with polling conducted over the past 10 years.95 However, the sheer volume of anti-Iran messaging—whether truthful or not—may increase hostility toward Iran among Arab publics. Unlike their Iranian and American counterparts, Arab governments benefit from a narrative focused on a shared Arab identity.99 Akin to the pan-Arabism of the 1950s and 1960s—without the secular element—the appeal indirectly calls on Arabs to turn their backs on Tehran and look to their own governments. This has recently gained traction in Iraq, where Shiite cleric Muqtada al-Sadr has repositioned himself as a nationalist leader and Saudi public diplomacy has made inroads in the country.100 Saudi Arabia, in speaking about its involvement and goals in Iraq, Syria, and Yemen, often makes references to bringing the countries back into the “Arab fold,” implying they are under the sway of Iran.101 This narrative places pressure on countries in the region to choose between Iran and Saudi Arabia and its allies. Even Saudi Arabia’s religious narrative, which is part and parcel of the country’s identity and public diplomacy, has not been immune to the country’s policies. Saudi Arabia’s 2016 execution of Sheikh Nimr al-Nimr, a prominent Shiite cleric in the country’s oil-rich Eastern Province who had long called for greater rights and economic opportunity for the religious minority, alongside 46 others—most of whom were accused of being al-Qaida members—further heightened tensions between the country and its Shiite populations. The executions also sparked protests in Bahrain, Lebanon, and Yemen.112 In Tehran, protesters stormed the Saudi Embassy, and the events escalated into a rupture of diplomatic ties between Iran and Saudi Arabia.113 Nimr’s execution called further attention to the plight of Shiites in Saudi Arabia and the exclusionary nature of the country’s pan-Islamic narrative.114 Saudi’s religious messaging also faces competition from other states such as Turkey and terrorist groups such as al-Qaida and the Islamic State. U.S. public diplomacy in the region has not taken full advantage of its comparative advantage, specifically the American model of education, science and technology, and innovation. Many anecdotes point to Arab populations disliking U.S. policies but maintaining positive views of the American model.144 This narrative can be advanced through joint university cooperation and exchange programs that bring Arabs to the United States and Americans to the Middle East; increased support for cultural centers, information centers, and libraries in the region that tell the U.S. story to local populations through various platforms; and intercultural dialogue focused on areas of mutual interest such as entrepreneurship, health care, and civic engagement.145 While current U.S. public diplomacy in the region uses this narrative to an extent, it is often overshadowed by CVE language. Currently, the most visible aspect of U.S.-government-led public diplomacy in the region is Secretary of State Mike Pompeo’s efforts, which are largely targeted at Iranian publics—using social media posts, speeches, and plans to launch a new 24/7 Farsi-language TV channel—and aimed at supporting anti-regime unrest and combating inaccurate portrayals of America in Iran.146 Both through his official Twitter account and the State Department’s Farsi-language Twitter account, Secretary Pompeo has also made Iranian female activists a focal point of his engagement. Skeptics of this strategy point to the Trump administration’s own questionable record of supporting women’s rights in the United States and argue that by taking up the cause of Iranian women, America is fueling the Iranian regime’s concerns that it is fomenting unrest in the country.147 This outreach to Iranian publics may be a useful indicator of how the administration could execute similar engagement with Arab audiences. Under the Obama administration, outreach to Arab and Muslim publics was a key priority, best represented by the Cairo speech.148 In his 2009 address, titled “A New Beginning,” then-President Barack Obama sought to reach out to Muslims around the world and establish a dialogue of mutual interests and priorities.149 This effort came during a period in which suspicion of the United States was high, following the Bush administration’s unpopular policies in the Middle East. While the speech has been critiqued for unnecessarily raising Arab expectations and failing to follow up on promises made, its symbolic importance—from its painstakingly chosen words and level of humility to the persona of Obama himself—raised the bar for the power and potential of U.S. public diplomacy. Importantly, the speech reflected the limits of U.S. public diplomacy and tempered any expectation that a single president could enhance American influence. Current U.S. domestic politics do not do much to enhance America’s image abroad, and they undermine any values-based narratives it projects. The United States is traditionally known and respected for enshrining freedom of the press and freedom of expression, but President Trump regularly attacks American media outlets, dismissing coverage he disagrees with as “fake news” and antagonizing the news media as an “enemy of the American people.”153 While U.S. history is rooted in embracing diversity, tolerance, and pluralism, President Trump uses incendiary language to describe immigrants and foreigners, invariably calling them “drug dealers, criminals, rapists,” and “animals,” and paints African, Caribbean, and Central American countries as “shitholes.”154 Setting aside the fact that this language is not befitting of an American leader, President Trump’s rhetoric and policies deeply tarnish the United States’ reputation in the Middle East and provide U.S. adversaries with more fodder to prop up their anti-American narratives. Furthermore, the U.S. government—taking a cue from its Arab Gulf allies—has taken to painting Iran as the region’s only bogeyman without addressing other Arab public concerns, such as disillusionment with their own governments; persisting frustration with living conditions and unemployment; and the U.S. role in destabilizing the region, including during the 2003 Iraq War. The risk in adopting an exclusive focus on Iran may limit America’s ability to address very real concerns of Arab audiences in the region and complicates any attempts to start a conversation or initiate any kind of durable engagement. Furthermore, discourse that criticizes Iranian policy, including its human rights abuses and corruption, without setting the same standard for U.S. allies in the region is likely to be perceived by some as sectarian and hypocritical. Despite a bleak landscape, it would not serve the United States’ best interests in the Middle East to disengage from the region. The United States still has a positive narrative to tell, and ironically, one that could play well to Arab ears, if developed properly and executed with humility. Crafting a narrative around American fallibility in all of its complexity, while highlighting the resilience of American institutions—including democracy and the rule of law—could resonate with Arab publics as they grapple with similar themes. These themes would bolster the narrative of the American model as one that is imperfect but consistently striving to improve. Designate a full-time undersecretary for public diplomacy and public affairs to oversee all U.S. engagement with foreign publics. Appointing an official undersecretary to this office is the first step for the U.S. government to underline the importance it places on public diplomacy and engagement with foreign publics. The individual who is designated to this role should be tasked with a clear mission—using public diplomacy to support U.S. foreign policy interests—and be competent and uncontroversial, as well as have the requisite background and experience for the task. Currently, this role is occupied by Heather Nauert as acting undersecretary. Create an interagency team as part of the Iran Action Group focused on competing with Iranian public diplomacy in the Middle East and countering anti-American narratives. This team would enhance existing U.S. public diplomacy programming and narratives in the Middle East to directly compete with those of Iran. If there is no will from the White House to do so, Congress should hold a hearing to analyze the propagation of Iranian disinformation targeted at the United States in the Middle East. Develop a U.S. metanarrative that puts mutual American and Arab interests—including education, economic prosperity, respect for human rights, and shared values of pluralism and tolerance—at its core foundation.S. public diplomacy in the Middle East should focus on developing a long-term, forward-looking metanarrative that is founded on an affirmative vision for the region. Worries about unemployment, poverty, and other economic issues continue to top the list of Arab publics’ most pressing concerns, and these should be the starting point for a U.S.-Arab dialogue.156 In addition, the United States should hold Iran and its Arab partners to a high standard when it comes to human rights and corruption. If the United States simply criticizes the Iranian regime for its poor record on these accounts while turning a blind eye to some of the same problems within the regimes of some partner countries, it risks being seen as hypocritical and picking sides in regional sectarian fights. Combat Iranian disinformation with factual information. Efforts to counter Iranian disinformation should refrain from using conspiracy theories and less-than-truthful narratives and focus instead on reliable and factual reporting. Truthful information should be used to counter inaccurate and misleading narratives about the United States and to call attention to issues such as Iran’s corruption, violation of human rights, and destabilizing actions in the region. In combating Iranian disinformation, the U.S. government should clearly differentiate between the Iranian government and the Iranian people, and avoid inflammatory rhetoric that vilifies Iranians. Redouble moral and financial support for U.S. public diplomacy practitioners in the Arab world. Public affairs and public diplomacy officers both in the field and in Washington should be given confidence that their work is important and has the full support of the administration. These individuals know their field and the region best, and their concerns should be supported. Commit to a zero-tolerance policy against Islamophobic and intolerant rhetoric both domestically and abroad. Currently, Islamophobic rhetoric is institutionalized within the executive office through the president’s rhetoric and policies. There should be a top-down effort to combat hateful, incendiary discourse both in the United States and in U.S. foreign policy. Resist sectarian and inflammatory language, and encourage Arab government allies to do the same. U.S. public diplomacy messaging should subtly show rather than tell audiences the full story in terms of Iran’s role in the region without resorting to belligerent language. This approach also avoids any conflation of the Iranian government with the Iranian people. U.S. stakeholders should encourage Gulf Arab partners to refrain from overtly sectarian language in the region. Such language only contributes to sectarian polarization across the region and is inconsistent with achieving U.S. interests. Global approval of U.S. leadership is lower than it was under the two previous American administrations.159 This is not, however, simply about the United States losing a popularity contest. The decline of the American brand among global publics, including in the Arab world—personified in the leadership of Donald Trump—impedes American influence and presents an obstacle for U.S. foreign policy in the Middle East. At the same time, adversaries of the United States, such as Iran, continue to galvanize Arab attitudes against America through inflammatory rhetoric and to counter U.S. influence in the region through public diplomacy—a tool they regard as indispensable to effective statecraft. Iran’s public diplomacy apparatus pales in comparison to its behemoth American equivalent, but the relative ineffectiveness of U.S. efforts in this sphere has created a space for Iran to invest both time and patience in crafting narratives and programming that appeal to Arab publics. The United States has traditionally been focused on outreach to Arab governments and opinion-makers at the expense of Arab publics, and this trend continues under the current administration.160 The United States has aligned itself with autocratic regimes in the Arab world, extending them a free stamp of approval and diluting the American brand in the process. In comparison, Iran is in the business of targeting and cultivating Arab publics and appealing to their concerns. While changes in U.S. policy in the region would lead to the most expedient, visible impact in shifting Arab attitudes and enhancing American credibility in the Middle East, this amounts to wishful thinking under the Trump administration. In the meantime, U.S.-government public diplomacy stakeholders should pay closer attention—giving an ear, or two—to what Arab publics are thinking in order to determine and develop ways to meet them halfway. * Correction, October 3, 2018: This report has been corrected to clarify that Iraq has the second-largest Shiite population in the Middle East. Sarah Alaoui is a Ph.D. student in the Middle East Studies department at the Johns Hopkins University School of Advanced International Studies (SAIS), where her research focuses on Arab public diplomacy. She holds a bachelor’s degree in political science from the University of California, San Diego, and a master’s degree in public policy from Sciences Po. The author wishes to thank Brian Katulis, Peter Juul, and Daniel Benaim at the Center for American Progress for their mentorship, guidance, and warm welcome to the team. Minna Jaffery also provided much-appreciated research assistance to the endeavor. The author would also like to thank: Mohamed Abdel-Kader; Alia Awadallah; Muath Al Wari; Spencer Boyer; Steven Cook; Rudy deLeon; Andrew Exum; Alan Eyre; Alberto Fernandez; Jon Finer; Kim Ghattas; Jim Glassman; Kristin Lord; Afshin Molavi; Vali Nasr; David Nassar; Fahad Nazer; Trita Parsi; Shawn Powers; Ben Rhodes; Michael Rubin; Karim Sadjadpour; Philip Seib; Barbara Slavin; Samuel Tadros; Behnam Ben Taleblu; Shibley Telhami; Ali Vaez; Alex Vatanka; Moira Whelan; Doug Wilson; Brent Woolfork; and William Youmans. The views expressed in this report were informed by comments from these individuals, but the analysis and conclusions are solely the author’s.